And six days later, here’s the after! Of course there was a lot that happened in those six days. My sister, Andrea, documented the whole renovation process via video so we’ll cover a lot of those details when we release that footage later, along with a couple other videos she did for the project–including the reveal for the family–it will make you cry! 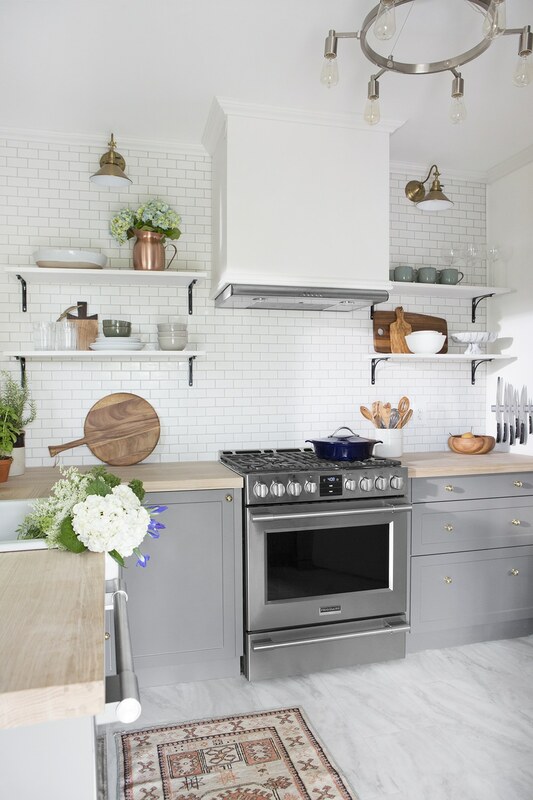 The goal for this kitchen was to really make it a pleasant, professional-grade cooking and entertaining environment for Judd and Betsy, to maximize storage and refrigeration (they have 2 teenage boys at home! ), while also introducing them to a lot of modern conveniences, like a dishwasher. I thought it would be best to take you through each of the main three walls (there was a half wall on the 4th wall that we removed) of the kitchen and the transformations they went through, as well as, the choices we made. 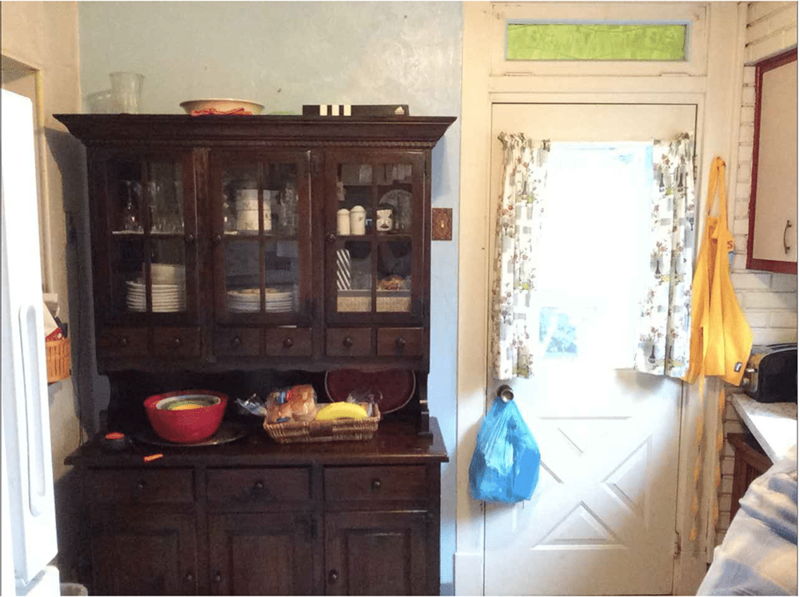 You can barely see it in the before photo, but there was a half wall making the doorway into the kitchen from the dining room smaller. We removed that and Chris built up the wall to be the depth of the cabinets. We also tore off the plastic green covering on the transom window and Chris figured out how to flip the door and make it out swinging (something we learned is easier said than done. We’ll share more tips on that in the renovation breakdown post.) 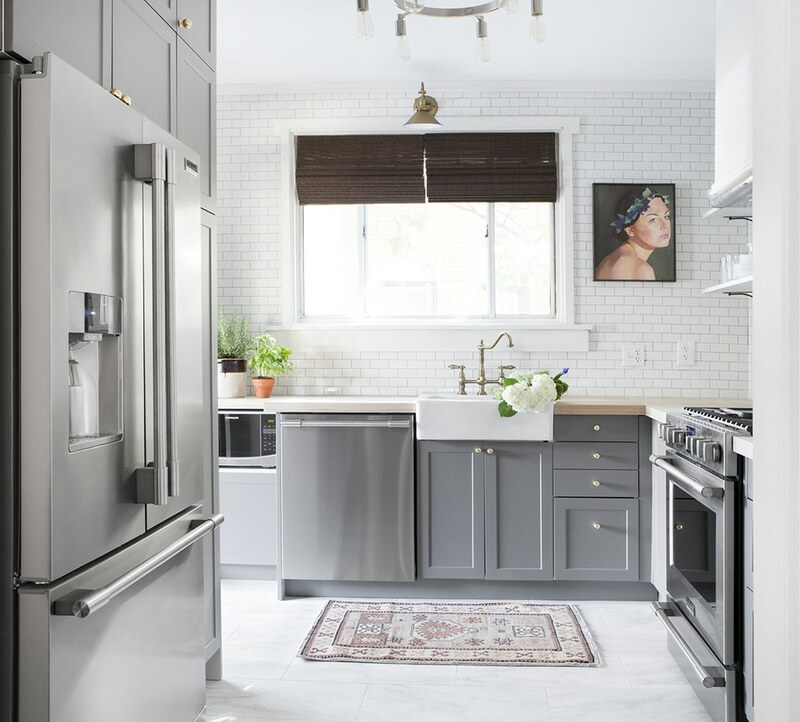 We outfitted the space with the Frigidaire Professional Counter-Depth Refrigerator and surrounded it with floor to ceiling Ikea cabinetry fitted with Semihandmade shaker doors in Super Matte gray. We ran a water line over so they could have filtered ice and water (another first!) and all their fresh food at eye level. On the outside, the counter-depth design saves precious inches in the smaller kitchen and inside the fridge, there are organizational solutions galore with fully adjustable shelves and bins. Knocking out the half wall really allows those french doors on the refrigerator to shine. They open alllllll the way and it’s like a food fashion show inside. Betsy told us all about how much her boys eat and how she preps dozens of sandwiches and wraps for them to eat after school. It’s so special for them to have the space to store those things now, and at eye level! 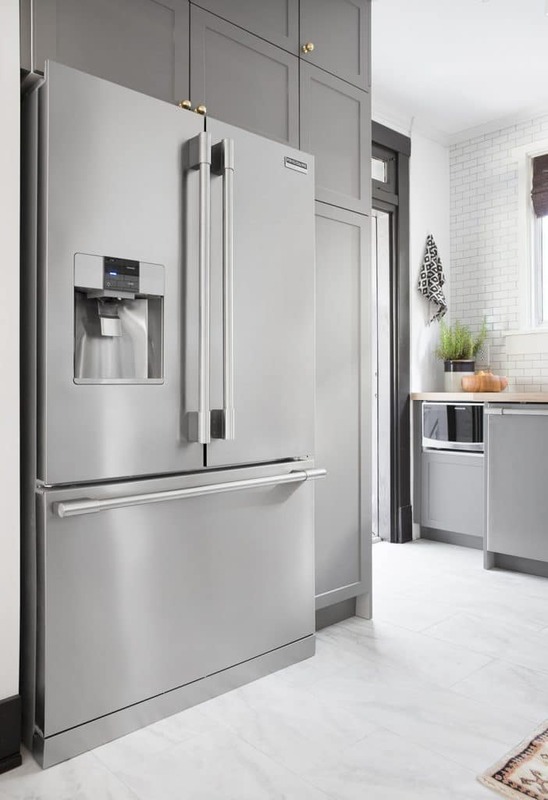 The stainless steel fridge has the same SmudgeProof finish as the rest of their appliances and all the compartments you can dream of to organize fresh and frozen food. And we designed their dry goods to be right next door. The tall cabinet to the right of the fridge is outfitted with pull out drawers for optimal pantry storage. 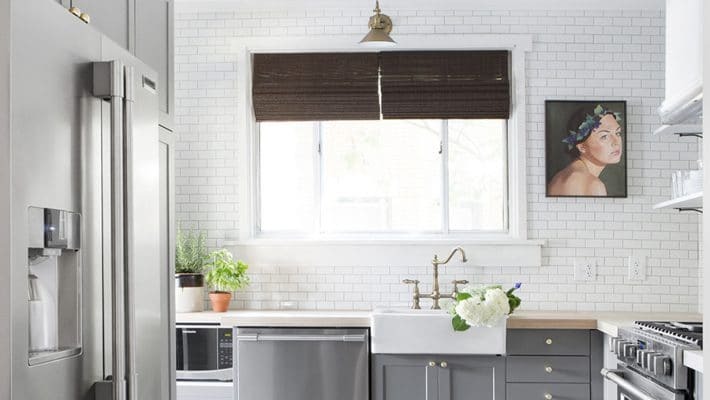 And then we added another 15″ cabinet on top of that and two cabinets above the refrigerator for less-used items like crockpots, ice cream makers, or a large stockpot you might only use for big family gatherings. The back window wall went through some drastic changes, but goodness, she turned out so beautifully. Just tearing down all the soffit and scalloped window trim left us with a big, glorious, albeit slightly off-center, window staring back at us. Capping off a radiator that used to be in the far left corner freed up enough room for a dishwasher and under-counter microwave–a great way to save counter space and one of my favorite details. The close proximity of the back door to the back wall (bricked on the outside–not moving that!) didn’t leave enough room for a standard size 26″ depth countertop like the rest of the kitchen, but it was just deep enough for a small cabinet and microwave. Since counter space was something we were trying to maximize here, we came up with an easy solution for an under-counter microwave that looks built-in! We used a standard 21″ wide, 15″ depth Ikea base cabinet that we ordered an 18″ tall door for instead of a standard 30″H door (which would have covered the whole cabinet front) so the microwave would remain visible and accessible. We placed a shelf (just one that comes with Ikea cabinets) right at the opening to support the microwave and ran an outlet behind. It was the perfect fit. They already loaded up their cookbooks in the small cabinet below. Next to that, the Frigidaire Professional dishwasher is so sleek. I love the hidden controls and the clean-lined, but substantial handle. 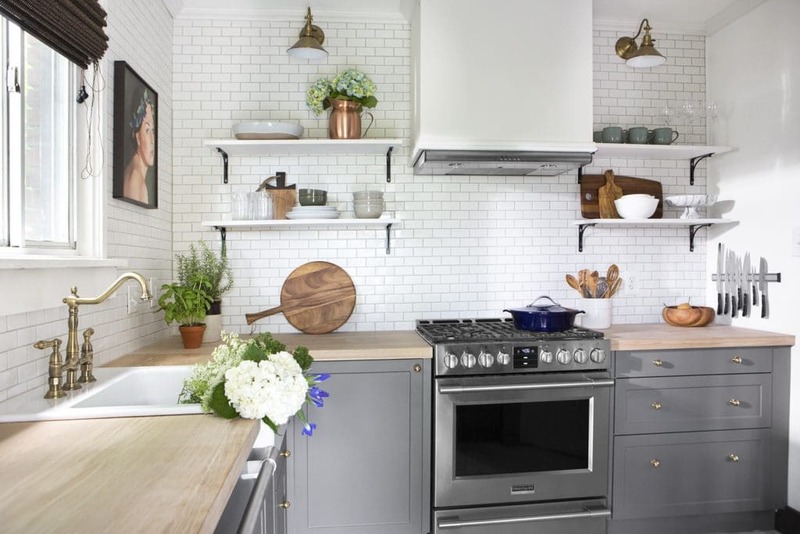 When planning the layout, we wanted to make sure that whoever was unloading the dishwasher would be able to easily access the open shelves and the utensil drawers (to the right of the sink) and the corner cabinet which has two carousels in it full of Anolon pots and pans. Having this dishwasher in our own home for the past several months, I was excited to show Betsy and Judd all of its tricks, like the 30-minute cycle, and the adjustable top rack that easily fits larger pots and pans. And, of course, the blue light that shines on the floor signaling the dishes are done is everybody’s favorite part. The sink is a single bowl apron front sink from Ikea (all the sources for the kitchen are linked at the end of the post). Chris drilled 2 extra holes to accommodate this beautiful bridge faucet we picked out for the space. It was quite dramatic and nerve-wracking and I’ll go into that more in the reno post, but it was worth it. We ordered 2 slim doors from Semihandmade to fit under the sink cabinet (an option that’s not available through Ikea) to keep it symmetrical and also since space is at a premium, smaller cabinet doors take up less space when opened. 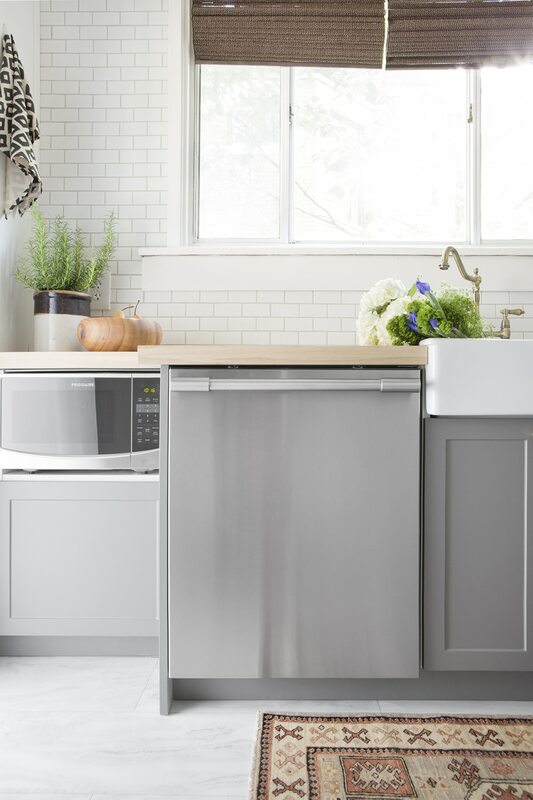 We installed this Frigidaire Professional Front Control Freestanding range (the same one we have in our kitchen x2) and can’t get enough of the built-in temperature probe, easy glide racks or the Powerplus 2-in-1 burners in the center of the range. The small center burner is great for simmering and the large griddle burner (comes with the flat top, too!) makes pancakes a breeze. You can cook up a storm on this range and I have no doubts my uncle Judd will do just that. One of my favorite features is the convection bake and roast options. We baked cookies for them before the reveal and they were done in minutes, which was good since we could barely wait another minute to show them their new kitchen! Above the range, we installed this 30″ hood inside a custom cover my uncle, Thom, made for the kitchen. The hood is a convertible one, meaning you can either recirculate the air or vent externally. Since this wall doesn’t vent to outside, we opted to make it recirculating and there are two circular vents on either side of the hood cover, at the very top. Moving the fridge to the other side of the kitchen allowed us to add more base cabinets (hello, storage!). We decided on 30″ drawers, which are just so easy and versatile. You can fill them with spices, cooking utensils, linens, and the big drawer at the bottom is perfect to house small kitchen appliances like a toaster, blender, etc. We mounted a magnetic strip and line of Wusthof knives (Chris’s favorite) on the wall and I can only imagine the kind of work that extra countertop will see now. 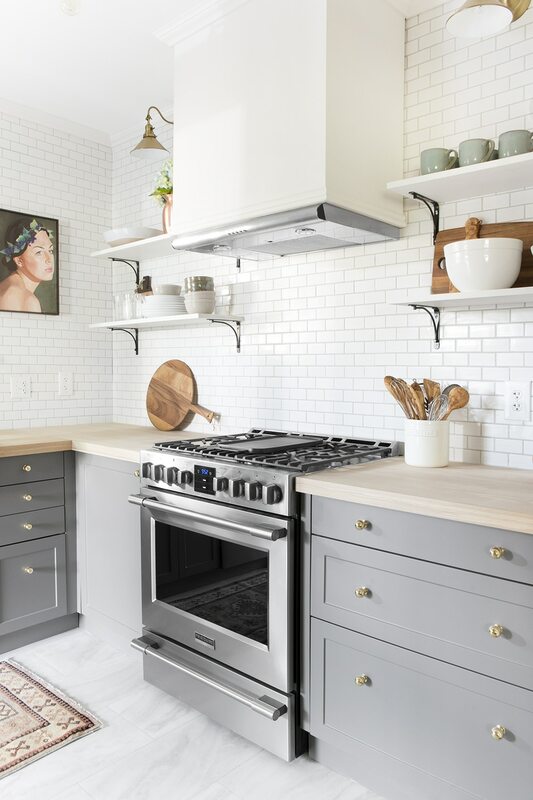 The open shelves were the one thing on Betsy’s wish list, and since we added so much extra storage elsewhere, we loved the idea of keeping this wall open and airy around the range hood. We used these simple, budget-friendly brackets and painted poplar boards (measuring 29″ on one side of the range and 36″ on the other) as our very last project. After the paint dried, we secured them to the wall with heavy-duty anchors and loaded them up with every day dishes, glasses, bowls and mugs that are used most often. We’ve heard a lot of comments about open shelves, and how things get grimy and dusty. From our experience (we have open shelves in our kitchen, as well), as long as the items you put on the shelves are used at least weekly, you shouldn’t have any problems. Now let’s talk about lighting. Lighting is important everywhere, but perhaps most essential in a kitchen. When you’re working, it’s nice to have it brightly lit, but sometimes, for dinner parties, you may want it dim and moody. I always say every room needs 2-3 light sources, and this kitchen started out with a singular light bulb lighting the whole room. We swapped it out for this beautiful semi-flushmount chandelier with 6 bulbs that ties in well with the stainless appliances and is close enough to the ceiling that no one is going to hit their head on it–hard to find statement lighting that fits that bill. Above the open shelves and window, we installed aged brass sconces on a separate switch so they can have either the overhead light on, the sconces or both. And they also have a light in the range hood to illuminate just the cooktop if they wanted. Lighting makes such a difference and is absolutely worthy of planning and purchasing. For the countertop, we went with another light, but warm option–white oak plank style countertops from Craft Art. We didn’t get a chance to seal them before we left (they needed 72 hours to cure and we just didn’t have the time! ), but we left them with this sealer and finisher that will enrich the countertops, is food safe, durable and won’t yellow the white oak. In a small kitchen, it’s easy to fill it with so much eye candy that it starts feeling busy, so we were careful to edit and make sure everything had a function and purpose, with one exception. We commissioned my sister, Victoria, to do a painting for the space and it’s the only thing in the kitchen that’s purely for decoration only–it was inspired by Bacchus, the Roman god of agriculture and wine. The tiny grapes in her hair are reminiscent of the grapes in Betsy’s grandmother’s backyard orchard. Portraits are very in right now and this one is so beautiful, I could see it hung anywhere. There are prints available in three different sizes here. We hung the painting to the right of the window to help balance the off-centered window a bit–so maybe even it has function. 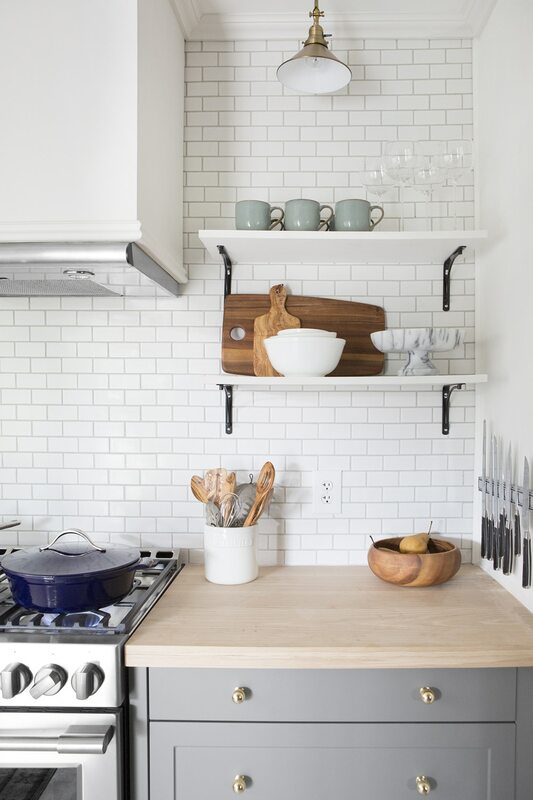 There’s a lot of other supporting characters that really help this kitchen work: the small-scaled subway tile is appropriate for a smaller kitchen. The shiny, heavy, smooth knobs in unlaquered brass from Rejuvenation remind me that hardware is always a worthy splurge, and the crown molding around the whole room (something we decided to do while we were there!) 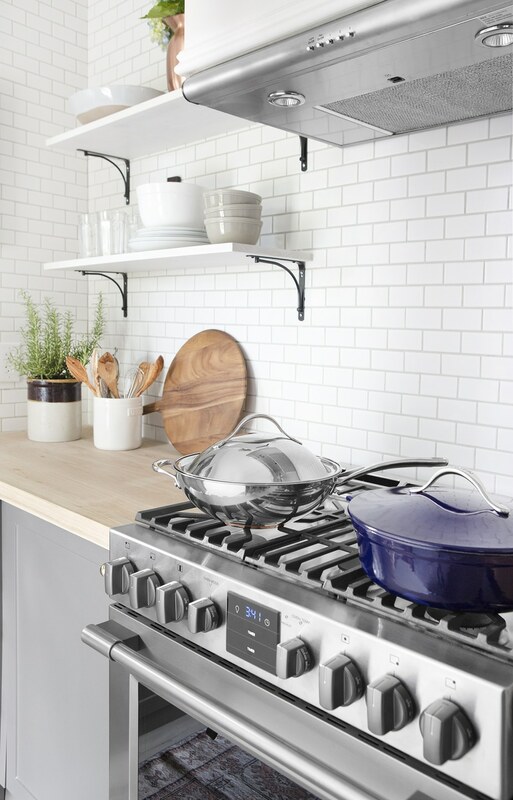 is a quiet touch that elevates the whole kitchen. 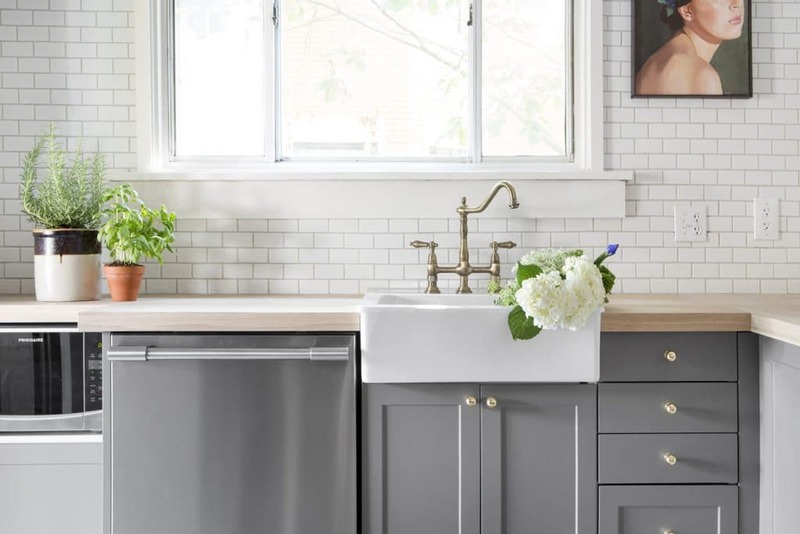 There’s still a lot more we’re excited to share about this kitchen: the renovation process and video, the reveal to the family, and the cost breakdown, which a few people have already asked for. So all that’s coming! One thing Chris and I realized when we were done was although this is a small kitchen, this isn’t a compromise kitchen. Nothing feels like it is missing or we’re left wanting–not even more space. We packed it full of storage and workspace and the same full-sized appliances you would find in a larger kitchen without expanding the footprint. It’s a kitchen I think anyone would be happy to cook in and one the Worrall family will enjoy for years and years to come. And since I know they’re probably reading this, share your favorite part of their new kitchen in the comments! All of the after photos were taken by the incredible talented, Pittsburgh and NYC-based photographer, Adam Milliron. You can check out more of his amazing work here. And yes, we’re still pinching ourselves he photographed this space for us. Thank you, Adam! This kitchen renovation was sponsored by Frigidaire Professional. Hi! 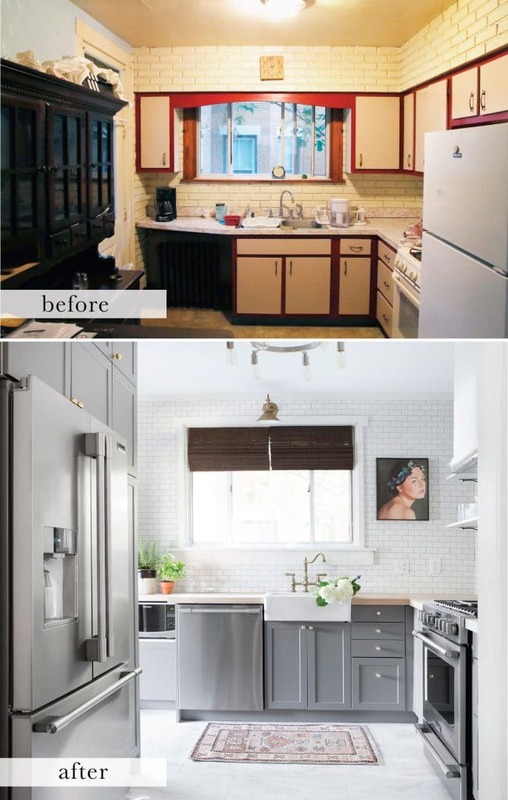 I just ran across this kitchen renovation and LOVE it! I’m curious about the white oak countertops, how do they hold up to water? And how much maintenance are they? Seal them with a few coats of waterlox and they’ll last many years with no issue! Hello! (Sorry if you already answered this somewhere :) ) We are about to embark on Semi-handmade doors with our Ikea kitchen. We chose the Graphite color for our bottom cabinets. I am wondering, when you open the doors/drawers, do you see the white Ikea bases behind them? Or maybe through the gaps between the doors/drawers? Did you paint or did you consider painting the Ikea frames to match super matte grey? Any thoughts on this? The graphite is much darker and I’m worried about the contrast. We are using white on our uppers. There are places where you may see a sliver of cabinetry but since you’re doing white uppers, I would do white interiors still. You may not see it and I can guarantee no one else will. Oh my goodness! 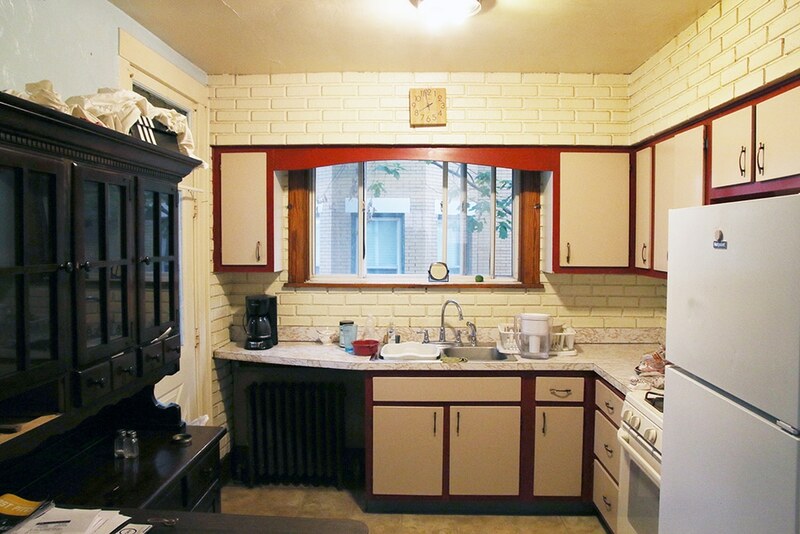 As many times as I’ve looked at this kitchen I never noticed that the sink and window were off center. The placement of your sister’s painting really did the trick! Nice work! thoughts about matching gray paint for the cupboards to the stainless appliances? Do you think a lighter gray is an option? Our kitchen tends to be a little dark. I hope the family still loves their kitchen. How could they not?! They still love it! Lighter gray would be so pretty! I’m getting shaker style cabinet doors as well, but debating placement of the hardware. How have yours been holding up on the drawers where the hardware is in the center panel? It’s worked great! Semihandmade doors are really sturdy. Wow, what a beautiful transformation! 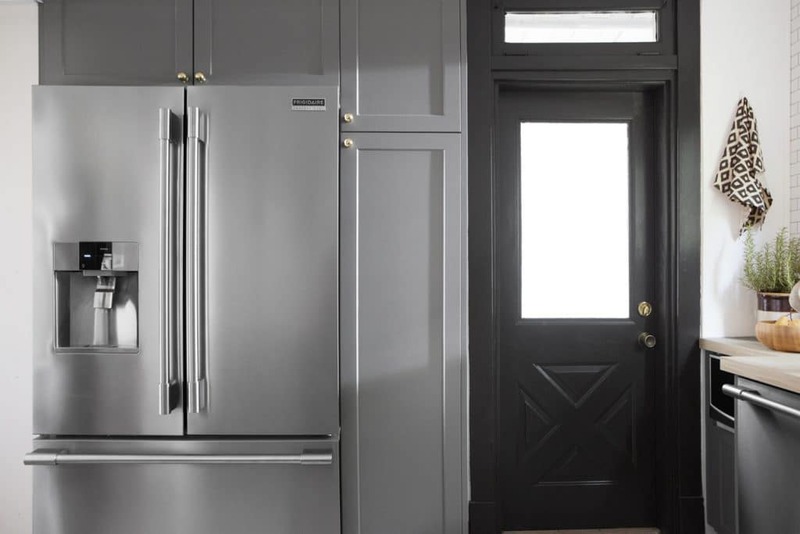 Quick question – I know you used semihandmade door fronts in matte gray, but is there a paint color you recommend that is close to this Matte Gray that I might be able to use on my existing cabinets? Also, I dont know if you guys painted any walls, if so, what was the wall color used? Benjamin Moore Dior Gray is pretty close. Great kitchen! we are planning to do something similar in our kitchen. what size cabinets did you use above the fridge? the two stacks look perfect, they are just above the fridge and it seems flush with the ceiling. did semihomade sell you the side paneling for the pantry and fridge? I believe they are 12″ and yes, the side paneling is from Semihandmade too! Stunning design and execution. May I ask what the project budget was? Thank you. You can see the project budget and breakdown right here. How much was the total cost of the cabinets? I have a similar sized kitchen and am looking into IKEA now, but I have no clue as to a what a decent price range is? Also, since you used semi homemade cabinet fronts did you just have to discard the doors that came with the ikea cabinets? or is it possible to order them without doors? Hi Chris and Julia, I’m in love with those oak counters. Have you had any problems with them staining or taking water damage? What do you hear back from the clients about how they wear? Hi! The kitchen is amazing! Love everything! A quick question- I’m debating ordering the flooring for our new kitchen and read the reviews on Wayfair. If states it has a green gray tint. Is this true? It def doesn’t look that way in the picture. Is the texture of the LVT hard? Does it feel like tile? Also- did you decide to add grout or was it necessary? Thanks for all the help!!!! Amazing! Such an inspirational transformation. Thanks for sharing and great work! O my word this is lovilee! I am also busy planning kitchen revamp and just love how you have the microwave under counter. The overall look is really goregous! This is absolutely amazing… It is amazing how you guys can spot the potential and actually make it happen! Wow! I love this kitchen so much, and I’m looking forward to the family reveal! Miracle!! Thank you for sharing sources and details – a remarkable project – love the portrait! Hi Julia, a thought occurred to me. Considering you removed a partial wall drywalling needed to be done. This can take a few days. How were you able to pull demolition, drywalling, installation of finishes and cabinetry in 6 days…. Just curious. My kitchen projects usually take longer —-. Again, great job. 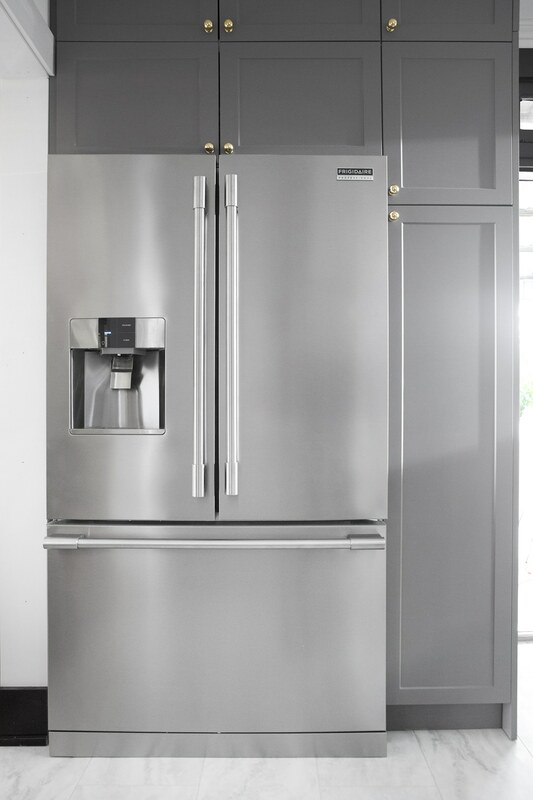 Can you please share the ikea cabinet dimensions you used around the refrigerator to make it look so built in? My wife and I are playing around with the Ikea software and cannot seem to make the cabinets work so well. Hi Matt! It kind of depends on your ceiling height. This home had 105″ ceilings (just over standard height) so we were able to stack 2 15″ refrigerator cabinets on top, and on the side we used a slim 80″ high pantry cabinet and we cheated the cabinet on top of that. It’s a 15″h x 15″ d cabinet, so it’s not as deep as the others. By attaching a side panel, it looks seamless. Wow I just got my samples from semi hand made and love love the matte finishes in grey,your choices of brass and the other finishes are so perfect and exactly like the samples I’m collecting thank you for sharing your fabulous makeover you are both very talented and your family is so lucky to have such thoughtful relatives to bless them with such a beautiful space ! I am completely blown away that this only took 6 days! This kitchen is GORGEOUS ? There’s actually SO much more usable storage it’s mind-blowing. An absolute gorgeous job Julia. And as a professional interior designer from Vancouver I completely concur that the additional storage in this kitchen is fantastic. Well thought out and so much more user friendly. I also love the finishes you have selected. 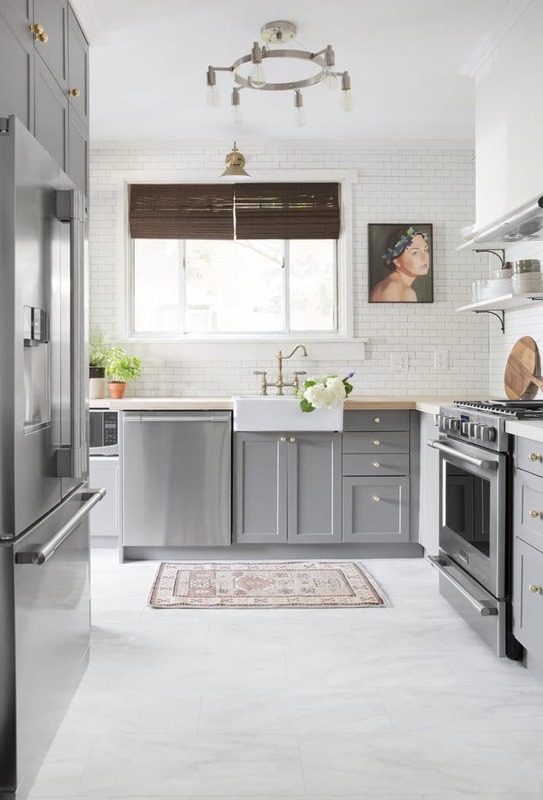 Good grey tone for the cabinets and the floor is terrific. Coming over from Rambling Renovators. Okay, regardless of timeline, this kitchen is gorgeous and amazing. So well, planned. That big window is lovely, and even though it isn’t centered over the sink, it feels generally centered over the dishwasher/sink area. The coloring: floor/counters/cabinets/tile combo is really lovely. It looks so, so, so much more functional and lovely. And then the timeline. Six days???? That blows my mind. Well done! 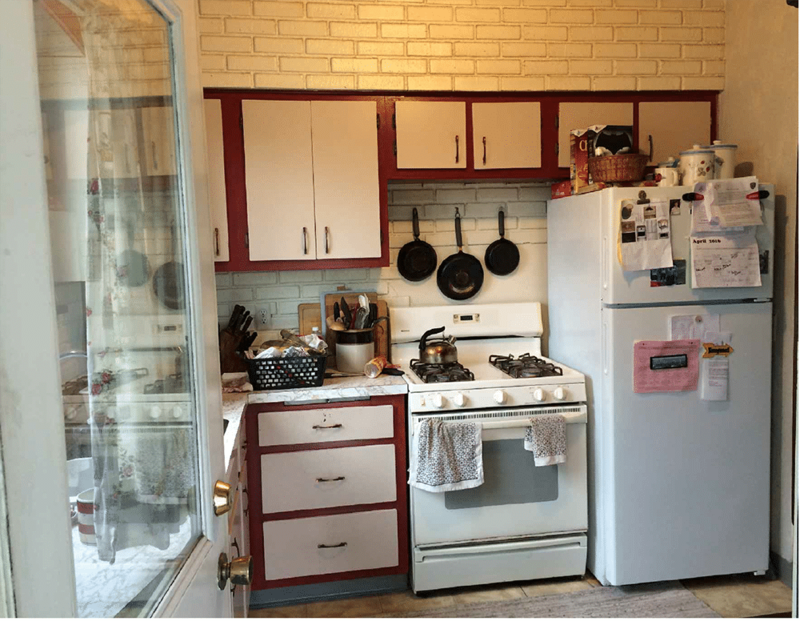 I am in the process of finishing up our kitchen renovation (that did not have a 6 day timeline) and I really like what you said about it not being a compromise kitchen. There are some things about the layout of the kitchen in the house that weren’t ideal, and I thought, this won’t be my dream kitchen, but so much better than what was there. After using the kitchen for the last couple of months (there are things that need to be finished, but it’s usable) I’ve realized that I’m super happy with the kitchen as it. Love the term “compromise kitchen”. Beautiful kitchen! Question: Do you have a “rule” for mixing metal finishes? From what I can see in the photos, you mixed brass, stainless and the black metal brackets. I generally like to have a metal repeated in a space at least once. :) But besides that, I love to mix ’em all up! oh my goodness, I have to agree with Heather and hope to add some kind feedback sweetie. I can’t take this time consuming click here to read any longer on your blog posts. Your system previous worked flawless, speedy, less annoying adds and ohhhhh so easy to scroll on and catch posts I missed. I know others have commented on this before and it really makes this loyal viewer go hmmm, is it all about the $/sponsors to get more view clicks …. We had many complaints before that the photos weren’t loading, but the text was. So having the posts truncated (where the main photo is the only one that loads, and not even at full resolution) was a solution we were advised to try. We’ve also started paying a higher monthly fee to our host for faster speeds, but the wonderful truth is THERE’S JUST A LOT MORE OF ALL OF YOU NOW. It’s a good problem to have. Just something we’re trying to sort through. I am totally blown away like everyone else here :D I’m currently pricing things out for my own kitchen remodel and before this, I was so certain I would just use Ikea cabinet fronts, but now you have me pricing out Semihandmade fronts because this is just SO SO GOOD!! And in general, thank you for sharing your sources and process and everything: it’s been SO helpful for me in planning my own remodel! Completely stunning! The colors and functionality are inspiring. This is fabulous! I’m most intrigued by the fact that you did this is a week. So I’m wondering if you think attempting a makeover in this manner is a good idea? Plan, plan, plan up front and then go for it. Do you feel like you sacrificed anything by doing it so quickly (besides sleep) or would you renovate like this again? We actually talked about that as we were nearing the end. We both agreed that if it’s possible–the quicker, the better. I am so excited to see this kitchen Reno. We also have a small’ish kitchen (12″ x 11.5″) and aren’t looking to blow out the wall between the kitchen/living room and seeing what you did with this home gives me hope that we can have something amazing even if it isn’t large, open concept with an island. You guys blow me away every time but this, THIS makes me speechless. Aside from being absolutely beautiful and a huge functional improvement, I just have no idea how it was even possible in the timeline. Bravo, well done, you should be very proud. Obviously I love the whole thing, but my favorite part has to be the black door and trim, and the transom just killlls me! I grew up in Pgh., and was always amazed that many of the big old houses had the most tiny, ill fitting kitchens! You have done a truly amazing transformation with little to work with! (no pun intended, lol). What’s best is that it looks like it SHOULD be exactly as you did it! You need to send your video to Hgtv, and get on the show that renovates Pgh houses!!! Again, Great job! I can’t take it anymore! I have to say something! I love your blog, it’s informative, inspiring and I really like your style. With the pleasantries out of the way, every time I want to read your blog, I have to take a deep breath and ask myself if my patience is ready to be tested. It loads, reloads and loads some more…slowly. I wouldn’t say anything except this is the only blog my iPad has a problem with. It’s exasperating to have to let it load, only to have to click on the “read more” to yet again wait for it to load again and heaven help us if I accidentally touch one of the ads as I’m in for another reloading treat. Then, just when you think the fun is over, I have to hit the back button to read any post I might have missed and start the merrygoround all over again. I just want to read your blog. I understand advertising is a huge part of that for you (the only explanation I have for the problem) and I respect it but why is your blog the only place I have an issue at? First world problem? For sure, I’m embarrassed to even be mentioning it but gosh I sure like your blog and it’s driving me nuts. Heather, we are SO sorry. Our traffic is growing leaps and bounds and we are trying to keep up with it. We are also going through a site audit to pinpoint other areas with issues we may need to address. Thank you for reading and being so positive. Know that this is definitely in the forefront of our minds and something we are anxiously trying to get fixed asap. Heather, I am having the same problems… Luckily the content is worth the wait. Remember dial up internet? Perhaps you are too young, now that was time consuming. The end result is so lovely! Ugh, it makes me want to throw a grenade in my kitchen and run. One not-so-glamorous question: how did you deal with inspections? If any were required, that is. I know different states have different requirements…. un freakin believable! you guys are getting GOOD, like RUHL GOOD at kitchens! You can see you thought of every last detail in this reno, and to pack it in 6 days – my goodness. I think a standing ovation is in order. Chris & Julia….WOW WOW WOW! This is simply stunning and the fact that you did it in 6 days?! Holy smokes that must be a record. We knew this was going to be good, but you really hit this one out of the park! Congrats on such an amazing space. Amazing job! I can’t believe you were able to pull this off in 6 days! As for choosing my favorite part, I just can’t because I truly love it all :) Your family must be so very happy! Love everything!! Amazing job! I so enjoyed scrolling through all the pictures! What a stunning transformation! Love how well the cabinet color works with the stainless appliances. A beautiful, functional space. LOVE LOVE LOVE!!!! I love how you mix tradition and modern style together and make it look so timeless. I am in the early/beginning stages of planning my kitchen/dining room renovation (convincing the husband we should reno the kitch stage). Our 70’s house has soffits that go around and I would love to get rid of them. there is no duct work in them and I am wondering how difficult it is to demo them and redo the ceiling? Depending on the difficulty level might determine if we do a full gut/reno or a minor upgrade! If there’s no duct work in them (as was the case with this kitchen), then you HAVE to go for it. Patching the ceiling will be 100% worth it. It is beautiful! You guys did and amazing job and have given me hope for my small kitchen! I think this is an amazing improvement, nice work!! I’m just curious, from the pictures it looks like they lost a lot of cupboard space with the lack of upper cabinets, were they able to fit everything back into the kitchen? I’m always torn about the functionality of open shelving. My heart feels so full for your Aunt and Uncle. So many people aren’t able to have the kitchen of their dreams and they just work with what they have. It makes me smile knowing that you were able to do this for them! I love every detail, It is gorgeous and functional. AMAZING job Chris and Julia! Wow! What an incredible transformation!! They are so lucky to have had you do this for them. I love everything about this kitchen – a real stunner! This looks so amazing!! Beautiful job, and even more so b/c there’s a family connection to the space. I’m interested to know how you installed the microwave under the counter. Did you have to leave venting room in the back? Love the whole look! I’ve already told you a thousand times how great this room is (because IT SO IS), but I am loving the sink/faucet combo! Can’t wait to hear more about those details, since we debated adding extra faucet holes in our own bathroom… and chickened out. I love it!! What a great kitchen in such little time. I really love how the cabinets look, and I am curious to hear your thoughts on the quality of the semi-handmade doors. Would you use them again, and how their compare to the door fronts in your home? They are thicker, heavier, and beautiful! The matte finish is really luxe and the color is warm. I would use them again (in my own home!) in a heartbeat. I’m glad to hear they are great quality. I keep debating between IKEA/semi-handmade vs. custom cabinets. I also want to thank you for the incredible list of resources you offer on your posts! I love it and know it takes a ton of time. I have always appreciated how open you are on you resources, and especially on your cost breakdown. It helps so much to see the real cost of remodeling and what to expect as I head into big projects. So thanks again for you kind and honest answers. As with most things, it looks even better than the plans! I was afraid it would look too dark but it really is just lovely and bright, very classic and timeless! Hope you get to do more kitchens!!! It was a true labor of love :) And as crazy as it was to put finishing touches on that painting on site, I love that that’s part of the story. Thank you again for commissioning me! This is amazing! I love every inch of IT and wish this was my kitchen. I love how well planned it is and how well you usel up the space. And to think you made it so fast! Was IT only you two who worked on it or did you have help? We definitely had some help! My Uncle Victor was there everyday ready to work. My 16 year old cousin, Louis, helped whenever he wasn’t working, my uncle Thom made the hood cover. My sisters helped put together Ikea cabinets and even tried their hand at tiling a backsplash. Demo day was full of helping hands and we had a licensed electrician come in to update the wiring. We’re so grateful for the help we had! Wow, that is gorgeous! It’s amazing how much bigger and sleeker it looks. I’m so curious to read about how Chris retrofitted the door to swing the other way, but also questioning how he managed to make it burglar proof with outside hinges (we once had an old farm house and we could pop out the hinges outside and take the door off if we ever forgot our keys!). Maybe it’s not a door to the outside? Wow, wow, wow! I’ve been really looking forward to the reveal! This feels so inspirational on a level that is also practical. 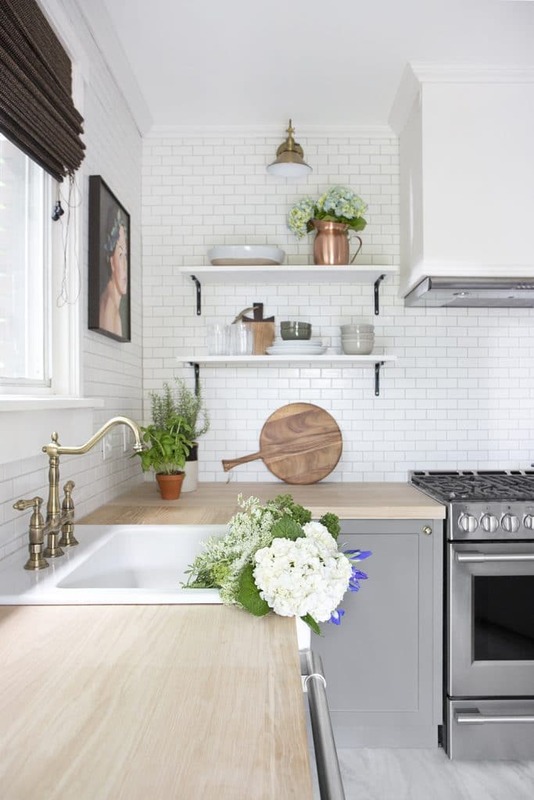 Because of our taste in homes (we prefer small/efficient and the older the better) we will probably never have a big, open kitchen to renovate. Many, many blogs and renovations focus on large kitchens with open plans, islands, and dream sources that are just not going to be options for us in a historic home. This has the same amazing feel as those updates but in a price point and size, not to mention real-life obstacles like doors and radiators, that will likely be in our future. Thank you for taking on this project and for sharing it with us! I’m excited for the in-depth renovation posts to come! This is an excellent point that hadn’t really occurred to me — you’ve really hit on it. This is a kitchen perhaps like more of us really have — so seeing THIS one become beautiful is a way of showing that it really is a possibility even if you don’t live in a dream home. WHOA. This is absolutely stunning! Nicely done! You guys are just amazing! I can only imagine how happy your aunt and uncle were the first morning they woke up to their finished kitchen. You can tell you put your heart and soul into everything you do. I love how thoughtful and purposeful you are when planning a space. And now to quote the “To Theme or Not To Theme” episode, I’m sure your Uncle Judd is so excited to get cooking, he’s probably at the grocery store yelling “Caesar! Romaine! Iceberg! Give it to me now!” Ha!! (By the way, I’ve listened to that episode THREE times now because that story makes me laugh so hard!) Love you guys! Keep up the amazing work! Everything is gorgeous! It’s amazing how much bigger the space looks with lighter brighter color palate and removing the soffits! Great job! I watched your whole process on SnapChat and thoroughly enjoyed it! You guys are an incredible team and I love how this space turned out. Once again, nailed it you two! AMAZE. Amazing job! Such hardwork & you would never know it was completed so quickly. The amount of love that was poured into this project is clear – great post, love the clear before and after photos. 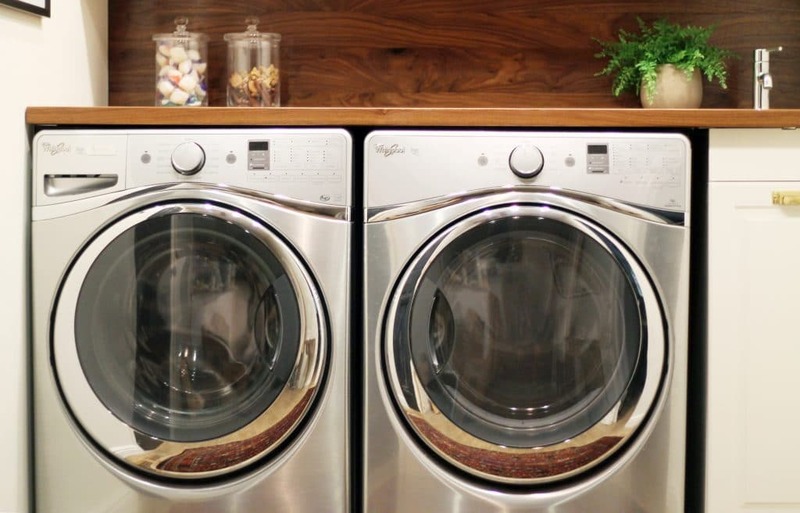 Smudge free appliances – sign me up! I have been drooling over this on instagram and I really can not believe those floors are luxury vinyl tile. Wow! I can’t wait to see the video and see the space with people in it – it adds so much scale. Amazing design work and this really pulled together beautifully! This is beautiful and an enormously gigantic improvement over the before. 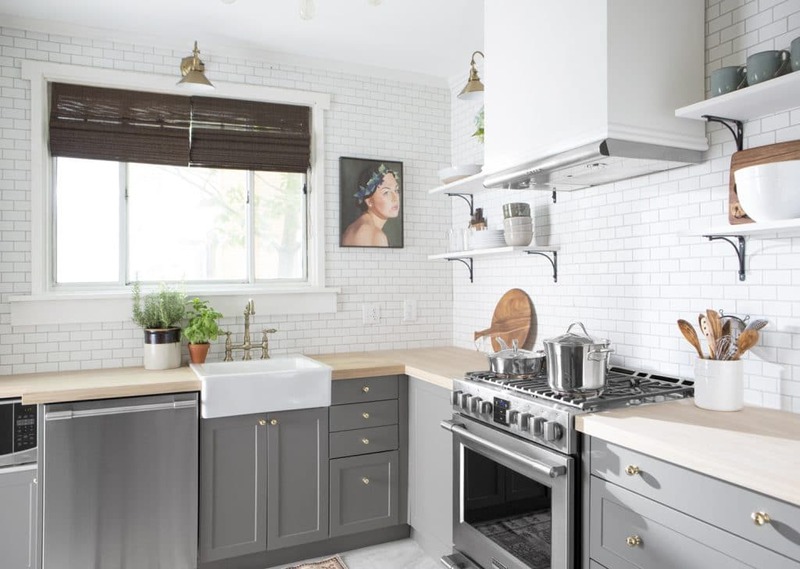 However, the use of gray cabinets, brass hardware, open shelving and white subway tile is a little… overdone at this point. Would have loved to see something a little more unexpected! As long as your aunt and uncle love it though, that’s all that matters! We worked closely with the family to choose finishes and colors that they felt comfortable with and fit their home. I think it’s a classic choice. Definitely a classic choice. There’s a reason that classic is classic. You can never go wrong! Oh my goodness. It’s AMAZING! You made some really solid layout decisions. When you showed the range wall I couldn’t believe the difference! It’s so light and airy! Before you used Frigidaire in your Reno I had never really thought of it as anything special. Now I’m thinking I’ll use them in my upcoming kitchen renovation. I love how minimalistic everything is. 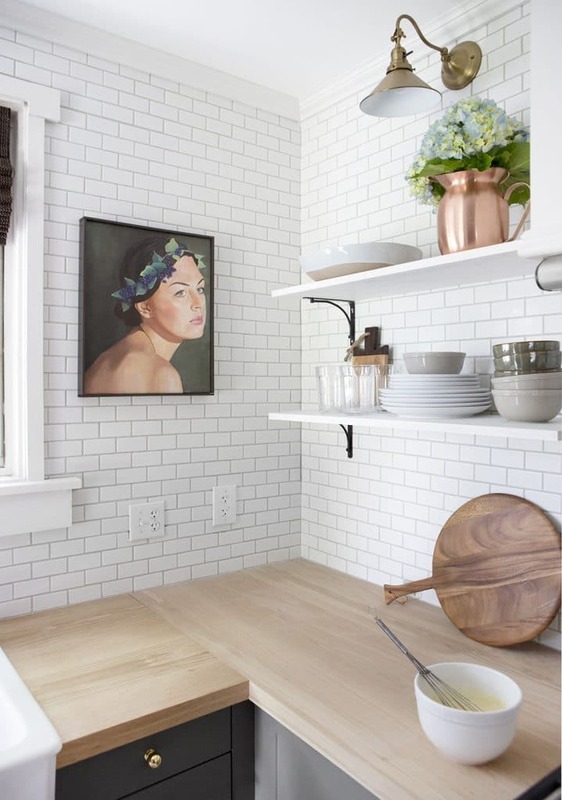 Another favorite part is the smaller subway tile. It completely tricks the eye. I’m used to the scale of the regular tile and because of that my brain assumed the kitchen must be way bigger than it was. Way to go on this gorgeous kitchen! It is so elegant – love it….and I love the portrait!!!! This turned out beautifully. You guys really made a small kitchen gorgeous and functional; one of my favorite makeovers by you two. This is amazing! I love that you all used some darker cabinets to keep it cozy but light tiling and open shelving to let the space breathe. So nice!! This is just soooo good! Six days has to be a record. How much do they love it? Looks great! What do you do to replace the radiator for heating? In the basement, the ceiling is open and there’s access to the floor, so we left them with the option of in-floor Pex heating. But, they are going to see how this winter goes. We widened the doorway to the kitchen and there’s a big, triple wide radiator right outside that doorway in the dining space. We also insulated all the walls, and an electrician said that they should be toasty in there. But! If not, the in floor heating is a great, affordable option. Where are the curtains from above the sink? Looking for that style above my sink! Thank you. Just added that to the source list! They are from right here. I’ve been anxiously awaiting this post as this kitchen is serving as the primary mood board photo for my soon-to-be husband and myself’s new home! I love this design and cannot wait for the cost-breakdown. Thanks for sharing! Love the design aesthetic. Holy smokes!!!! That is one amazing transformation! Thank you for sharing all the details. Do my kitchen next ? This looks amazing and I love everything about it! Wondering if I could get your opinion on something. 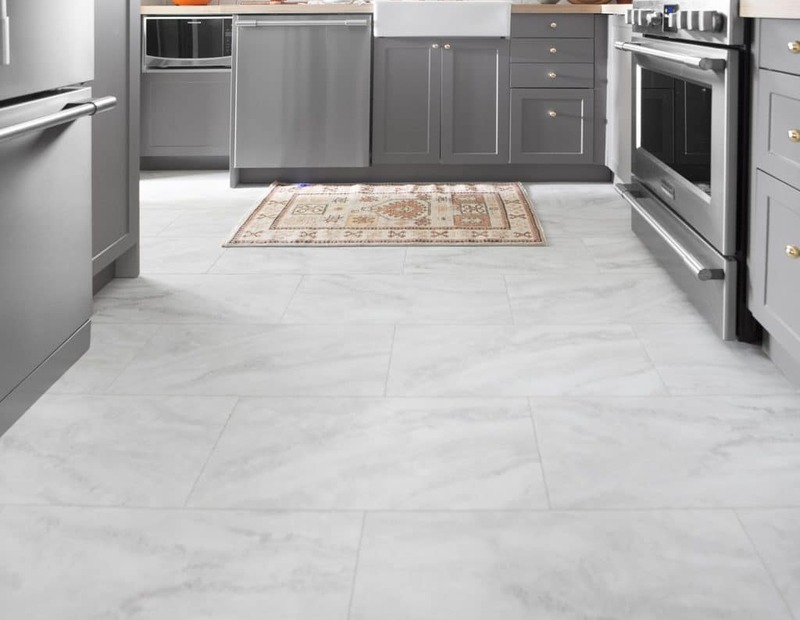 We’re looking to redo the flooring in our kitchen and living room, which is an open-plan of about 400 sq ft. We’ve always wanted black and white checkerboard floors and have found an interesting option (Perfection Floor Tiles, special order from Lowe’s). Here’s the rub – we had always envisioned 12″x12″ tiles, but the Perfection product is 20″x20″ tiles. Would this look crazy in such a relatively small space or am I the next trendmaker? Any input appreciated! Keep up the great work with the blog! Are you extending them into your living room too? What are the dimensions? My only concern is you won’t be able to adore the floors you dreamed of fully with the larger scale. Where did you move the radiator? I too have a very similar kitchen layout with a radiator. I want this transformation so badly in my home! Well done!!!! We capped it. In the basement, the ceiling is open and there’s access to the floor, so we left them with the option of in-floor Pex heating. But, they are going to see how this winter goes. We widened the doorway to the kitchen and there’s a big, triple wide radiator right outside that doorway in the dining space. We also insulated all the walls, and an electrician said that they should be toasty in there. But! If not, the in floor heating is a great, affordable option. We’ve never had an official heat source in our kitchen and it’s never been a problem. Since our kitchen is fairly central in the house, it is usually one of the warmer rooms and never feels cold! I wondered the same thing. Maybe they could consider a kick space heater if needed, to improve the warmth and feel of the room but still be sleek.